View Cart "10 levs, 2016, 150 Years since the First Railroad in Bulgaria: Ruse – Varna" was successfully added to your cart. 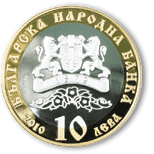 The obverse of the coin features the BNB logo and the year ‘1879’ on the strip, a floral motif beneath the logo, the nominal value ‘10‘ beneath the motif; the inscriptions ‘БЪЛГАРСКА НАРОДНА БАНКА‘ (Bulgarian National Bank), ‘ЛЕВА’ (levs) and ‘2010’ on the outer ring. 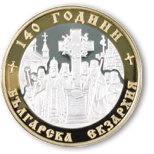 The reverse of the coin features a replica of the lithography ‘Monument of Liberation of the Bulgarian Church’ by Nikolai Pavlovich; the inscriptions ‘140 ГОДИНИ’ (140 years) and ‘БЪЛГАРСКА ЕКЗАРХИЯ’ (Bulgarian Exarchate) on the outer ring, with two small cross-stitches between them.